The $2 billion Brisbane Live entertainment precinct located in the heart of the CBD is about to progress to stage two of the Queensland Government’s market-led proposals initiative. For over 12 months the government has been reviewing the plan and is anticipated to provide constructive feedback which will push the project into a fine tuning and due diligence phase. Harvey Lister, chairman of Brisbane-based AEG Ogden, a subsidiary of global entertainment venue operator AEG, told the Courier Mail they are optimistic that Brisbane Live is now receiving the focus it needs with the State Government to enable it to happen. In preparation of the next stage, AEG Ogden has already prepared a detailed 150-page financial brief and appointed Jones Lang LaSalle to explore opportunities and ways to attract private investment into the project which would see the development of apartments, hotels, retail, commercial space as well as possibly cultural, education and research facilities based around the new 17,000 seat Brisbane Arena. 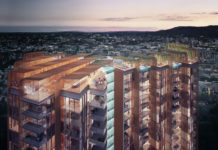 “The redevelopment concept for the whole of the Roma Street site is a truly unique one-in-a-lifetime opportunity and we believe its time has come,” he said. “Very few cities globally have the opportunity to create a commercial, educational, leisure and entertainment precinct in a world-class garden setting on a 20-plus hectare site right in the middle of the city,’’ Mr Lister said. The proposal is mirrored off LA Live, located at South Park, a district South West of downtown Los Angeles. Situated at the centre of LA Live is the 20,000 seat Staples Center which hosts basketball, ice hockey, boxing and wrestling as well as music concerts and theatres. Since its inception in 2009, the 10.9 hectare LA Live precinct has spurred on incredible growth and gentrification of the surrounding area, developing new hotels and residences like the Ritz-Carlton and JW Marriott. The precinct is serviced predominantly by a light rail line. LA Live has attracted private investment of public assets such as the 3,716 m2 open-air Microsoft square, the 7,100 seat Microsoft Theatre as well as museums, cinema and tv broadcasting facilities. Comparatively, Brisbane Live as it stands is larger by area (around 20 hectares) and is located on top of Queensland’s largest rail interchange hub. The positioning above Roma Street station gives the added advantage of catering not just to Brisbane audiences but to the whole of South East Queensland, a population catchment of well over 3.4 million (2014 figures). Like Staples Center, the Brisbane Arena could accomodate international concert tours, theatres like Wicked or The Wizard of Oz as well as potentially being the new home of the Brisbane International’s tennis finals. Harvey Lister said the ability for the Brisbane Live project to activate the night-life economy of the CBD to support the new Queens Wharf development is a compelling factor. AEG Ogden are reportedly moving quickly with the proposal, with hopes of getting final approval within one year and built by 2021-2022 to coincide with the completion of Brisbane’s other major development, the $3 billion Queens Wharf Integrated Resort. Hover over the icons below in the interactive map. Tim Nicholls, state opposition leader told the Courier Mail the project was a ‘game-changer’ and was behind the Brisbane Live project, so much so that if elected, he would overhaul the market-led proposals process to speed up approvals. Brisbane’s Lord Mayor Graham Quirk said he wants to see Brisbane Live progress to help boost tourism along with Queens Wharf, Brisbane Airport’s new parallel runway, new cruise ship terminal and the planned metro rapid bi-articulated bus system. Whilst the painfully decade-long squabble over Cross River Rail funding continues, there is one positive side effect of government inaction. The potential for pure integration of Cross River Rail with Brisbane Live. Both projects could be seamlessly integrated with one another creating a super-transit hub beneath the surface of Brisbane Live and sparing Brisbane residents with additional years of construction headaches. Cross River Rail already promises to turn the immediate area into a “vibrant precinct” with a new plaza and retail offerings. AEG Ogden meet with the Queensland Government this week to discuss progressing the project to the next phase. Great proposal BUT do we really have to put up with the ALP “bashing” by the LNP’s Nichols it really is a “pain in the arse”. Many people are sick and tired of this political crap! I think I’m more excited about this project than Queen’s Wharf! So glad this tired part of the city is finally getting some attention. What a time to be a Brisbanite! Would be great to see some detail of the Brisbane proposal …The “Artist’s impression of Brisbane Live main arena” images does not load and the LA one is not relevant. Is there somewhere where a scale model can be seen? – or even a set of plans? pdf? We would be mad not to give this approval and help with funding. But the ALP seems more interested in mining. I think they’re interested in getting re-elected and doing so by trying to provide (or being seen to) jobs outside the south east corner. That said, they’re doing a fair bit in Brisbane. Interesting, why not build bigger and better and if not bigger just something new and upgrade is good for people. A change is as good as a holiday humans need new and exciting and interactive places they can go for entertainment. Oc. I would like to disagree with you. But I think you are right. I think this is a very exciting opportunity, in an area that needs to be revamped. I do hope that the finer details reveal plenty of open space, that has character highlighting our lifestyle, is easy to move around in and through, and is not cluttered with obstacles. Having a viable and vibrant pedestrian link between King George Sq and Lang Park, that removes road closures and pedestrian choke points is essential for the growth of sporting and cultural events in this precinct. I would like to see the Live Arena expanded to hold 20,000 to allow for growth in Brisbane (& it’s entertainment), and the reduction from what looks like 5 towers to 1 or 2 buildings at the Normanby Grove Residential precinct (potentially allowing a children’s aquatic park to be included at the northern end). The government needs to take this opportunity to provide a better bus station underneath (not everyone travels by train! ), and the missing pedestrian links from the barracks and this project over Petrie Tce, and above the rail line beside Milton Road to the stadium at Lang Park. This adds to making this a better “Livable” City. Brisbane would be better and more jobs would come out from Live Proposal and is would make brisbane new world city and if u get the live prop it would till about how brisbane would stand out.